According to one source, a conch or shell trumpet is fashioned from the shell of a large sea snail by cutting at hole in the shell’s spire at its apex. In South Asian spiritual traditions, the conch appears in the iconography of Visnu and is famously performed as the Panchajanya (defined as “control over the five elements/five lower chakras) by Krishna on the battlefield of the Mahabharata War. In the tradition of the Vedic people who occupied the Indus River Valley Visnu is stationed in the role of Chief Administrator, Operator or Controller of the creation. Personal control of the gateways of consciousness located within the human body is achieved through practice of intensive spiritual disciplines including meditation, according to Yoga. Under these conditions, the Cosmic potential within the human body is said to operate, ascending within a subtle meridian that follows the spine with resultant expressions of higher consciousness and optimized functionality. This ascent of the Kundalini is accompanied by subtle inner sounds, described below in the testimony of a yogic monk who was witness to his guru’s demonstration of occult kundalini-raising powers. He touched his stick to my muladhara chakra and gave the order, “Get up! Get up energy!” Suddenly I felt something in my muladhara cakra and felt uneasy. Without removing his stick, Baba explained to everyone about the cakra. I heard what Baba was saying, but as though I was far away. Then after a few minutes, Baba said, “Cakra, dance!” Then he asked “Do you hear any sound?” “Yes, Baba, I hear the sound of crickets.” He pushed the stick a little. Then he moved the stick up to my svadhistana cakra. Baba explained to everyone about this cakra. Then He said, “Now dance!” I started to feel very uneasy and strange. I wanted to leave the room, but I could not. Baba asked me, “What sound do you hear?” I said, “The sound of ankle bells.” Baba explained that this was the sound of Lord Krsna, which all the gopis enjoyed. Then He moved the stick up to my navel (manipura cakra). He explained about this to everyone. Then he said, “Now dance!” I felt as if my stomach would burst. I started to feel suffocation. “What sound do you hear?” “Baba, I hear the sound of a sweet flute.” Baba explained that was the flute of Krsna. It was an intoxicating sound. Then Baba moved His stick up to my heart, the Anahata cakra. My body started trembling, but Baba seemed to be controlling it. Baba explained about the many propensities of this cakra. Then He said, “Now dance!” Then I felt as though I was floating in the ocean. Baba asked “What sound do you hear?” I replied that I was hearing the sound of the ocean. Baba said, “Yes, the sound of a strong wind, the hssss! of a storm. Baba moved His stick up to my vishuddha cakra, and explained that it has 16 propensities. He said that many ideas and thoughts are created here. “Now dance!” I told Baba I was hearing the sound of Onm. It was very sweet, very calming and quiet. I felt all my nerves and body start to collapse. I lost consciousness and fell backwards. Vancouver, BC – An exclusive new trailer published to YouTube on October 27, 2015, offers an inside look at Canadian alternative wellness practitioner Laurie Morningstar’s debut feature “Emotional Alchemy with Laurie Morningstar” (2015) now available as streaming on-demand video. At 75 minutes viewers journey through language and its role in deeper expressions of love embodied through access to the heart’s creative potential. Performance on a traditional First Nations drum propels the audience to deep introspection on non-attachment and entering the sacred heart. The production for “Emotional Alchemy” was taped earlier this month in Vancouver during a “Be Your Power” workshop hosted by Molly Warner and Eli Kaiser. Their previous collaboration with Laurie Morningstar saw the “Ascension Blast” music video for the song “I Release (The Voices of My Ancestors)” recorded inside of a labyrinth at Morningstar Transformations during the Supermoon Eclipse. “Emotional Alchemy with Laurie Morningstar” (2015) is now available as streaming on-demand pay-per-view video for rental or purchase via Gumroad, the preferred and trusted secure hosting and paywall service provider for NewsIO Plus. News IO Plus subscribers will receive access to this exclusive new feature as part of their regular service in December, 2015. Vancouver, BC – An exclusive new video published to YouTube on June 29, 2015, features Emotional Alchemist Laurie Morningstar discussing a live UFO Contact night vision skywatch event taking place in Greater Vancouver this summer. NewsInsideOut.com’s Jon Kelly will lead “Journey to Inner Space 2015,” a two-hour in-depth presentation covering his latest data and insights followed by a night vision skywatch at a secluded labyrinth on July 15, 2015. 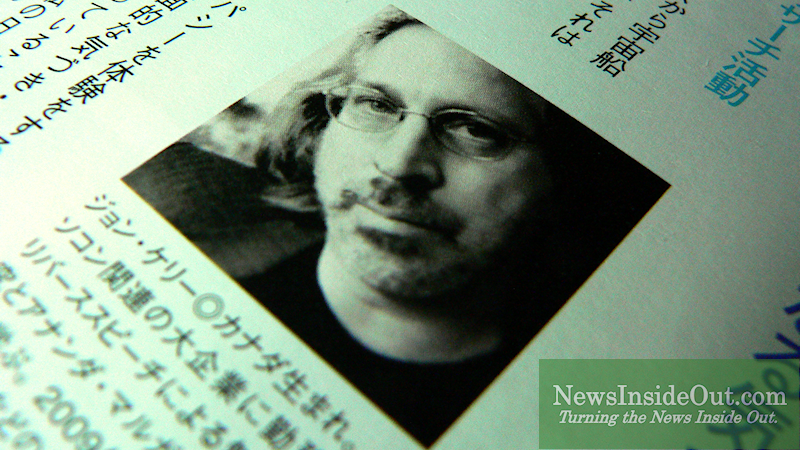 Jon Kelly’s UFO field research was featured in the June 2015 edition of Japan’s Anemone magazine. Jon Kelly’s internationally acclaimed body of original independent research covers communications phenomena of the unconscious mind, classical yoga meditation, photographic portraiture of the Vedic avatars of Vishnu, two-way visual communications with UFOs captured on tape and the inner dimensions of ET Contact. A pioneer in the application of 3CCD broadcast video and digital night vision camera systems, Jon Kelly has been active as a UFO journalist since 2009 with articles covered by mainstream publications including USA Today, Irish Independent and the Dallas Morning News. His career in broadcasting and investigative journalism began ten years earlier in a very popular role that resulted in number one Nielsen-ranked television news for CBS in 2006. “Journey to Inner Space 2015,” a UFO Contact night vision skywatch event with former CBS Radio feature producer Jon Kelly takes place July 15, 2015, from 8:00 to 11:00 p.m. Admission is $20 cash only at the door. For more information and directions to this exclusive event readers can call 604-531-5156 or visit the Morningstar Transformations website (http://morningstartransformations.com/). Kelowna, BC – An exclusive new three-part video series (Parts I, II, III) published to YouTube on June 25, 2015, explores the work of Emotional Alchemist Laurie Morningstar including a Summer Solstice celebration inside of a pyramid, spiritual experiences while Lakota Sun Dancing plus an Entering the Sacred Heart meditation exercise that viewers can try for themselves. NewsInsideOut.com’s Jon Kelly was at the Summerhill Pyramid Winery in Kelowna, British Columbia, where an audience of close to 100 people attended a 2015 Solstice celebration hosted by founder Stephen Cipes. The three-part Emotional Alchemy series furthers NewsInsideOut.com’s documenting the work of authentic spiritually-focused wellness practitioners. “Emotional Alchemy with Laurie Morningstar Part II” features Laurie Morningstar in a wide-ranging interview that discusses Entering the Sacred Heart meditation, Emotional Alchemy, Sun Dancing and contact with the ancestral Grandmothers. The alchemist describes how her public work with emotions clears the way for deeper expressions of love embodied through unfolding Akashic (Sanskrit: ethereal) records and access to the heart’s creative potential. A part of this talk emphasizes how the universe responds in practical ways to personal desires when one’s sense of “I”-ness and doer-ship is relinquished. “Emotional Alchemy with Laurie Morningstar Part III” features Laurie Morningstar leading an Entering the Sacred Heart meditation exercise for viewers to follow. “I think everybody’s a healer,” explains the practitioner in a preparatory talk that emphasizes healing Mother Earth via individual and collective energy-focused wellness practices. For more information about workshops and private consultations with Laurie Morningstar readers can visit her website Morningstar Transformations (http://morningstartransformations.com). For more information about ongoing community events at the Summerhill Pyramid Winery in Kelowna, British Columbia, readers can visit the All One Era website (http://alloneera.com).